Recently there has been a slew of books that have come to market and several blog post series about being brave, fearless, and courageous. I believe we are living in a time where God is speaking to His daughters and calling them to live boldly in their faith by looking beyond their circumstances for such a time as this. Understanding who we are in Christ and boldly trusting God to live courageously for HIM! From the moment I picked up Courageous Women of the Bible: Leaving Behind Fear and Insecurity For a Life of Confidence and Freedom by Latan Roland Murphy, I knew this was an extraordinary book and couldn’t wait to dive in. I began highlighting and underlining words that ooze with wisdom from the first few pages in the introduction. Words that caused me to pause. Words I needed to hear at this very moment my journey with the Lord. Words I know my sisters need to hear. Latan sets the stage by laying down these principles in the introduction. Courage advances us into opportunities we would otherwise shrink back from and avoid. Latan then examines the lives of eleven courageous women of the Bible and challenges the reader to think about her own life and how these brave women of the Bible can help her to grow in her faith. Come sit at the feet of each of these women and soak in the goodness. Through the study of these eleven women, Latan provides thought-provoking study questions along with interactive journal questions to take you deeper into your faith. 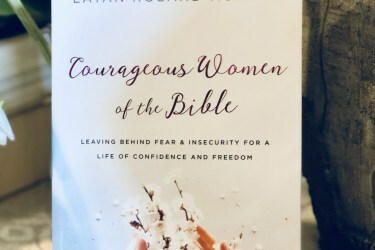 A special thank you to LaTan Roland Murphy, Bethany House Publishers, and The Blog About network for providing me with a copy of Courageous Women of the Bible: Leaving Behind Fear and Insecurity For a Life of Confidence and Freedom to review and one to give away. To be entered to win share this post and leave a comment below stating which of these eleven women in Courageous Women of the Bible you most likely relate to and why! The giveaway will run until June 15th, 2018, and the winner will be randomly selected from the entries and will be announced on this post.